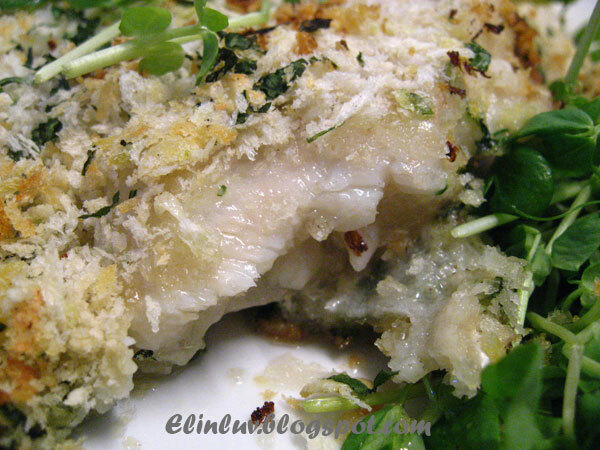 Elinluv's Tidbits Corner: Fish Papilotte - A Wrap-turous Meal ! 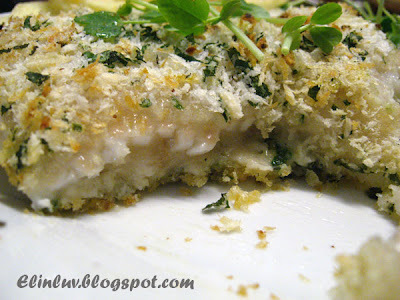 The ingredients required for this wrap-turous meal are a few pieces of fish fillet ( I use dory fish ) , day old bread crumbs ( I use the store bought crumbs ) , garlic, lots of chopped fresh italian parsley for the coating , butter or olive oil , salt and pepper and greaseproof paper. This preparation is so simple and easy. The end result a piece of sea treasure that have your lips smacking each other :) I know people thinks I am overly expressive when it comes to food , but you really have to try this out to agree with me. I know of one person who will agree totally.... yup my wild boar at home ! LOL! 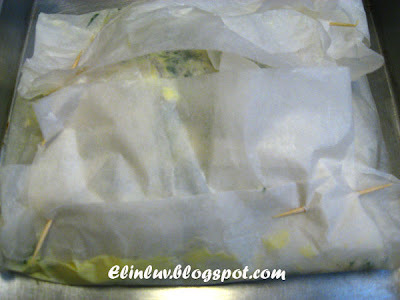 It is always fun to open the wrap at the table..
You think your guests will love their food served this way..? but the natural fish oil from the dory fish ! succulent on the inside mmmmmmm........salivating already ? enough to want to bake it yourself ?...lol! 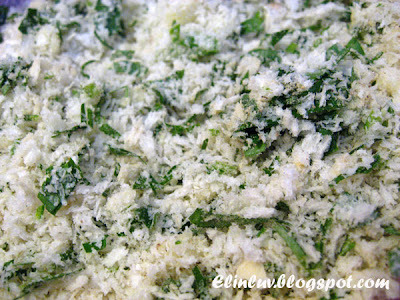 Process the bread parsley and garlic in a food processor until they resemble breadcrumbs. Spread the duck fat or butter onto the baking paper, then add half the breadcrumb mixture in the centre, level. 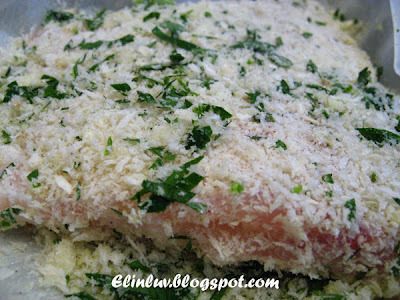 Place the seasoned fish ( chicken) on the crumbs and top with remaining crumbs . Cover with another sheet of baking paper and wrap into a rectangular parcel. Secure with bamboo skewers or staples and tie with string (optional ). Preheat the oven to 230°C ( my oven I set to 200°C ) . 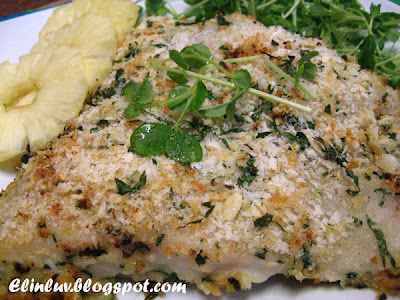 Place fish ( chicken ) parcel in the middle of the oven and bake for 25-30 minutes or until fish ( chicken ) is cooked and crust is browned. Remove and serve hot. The fish looks terrific! Crisp and succulent when you take a bite into it...yummy! 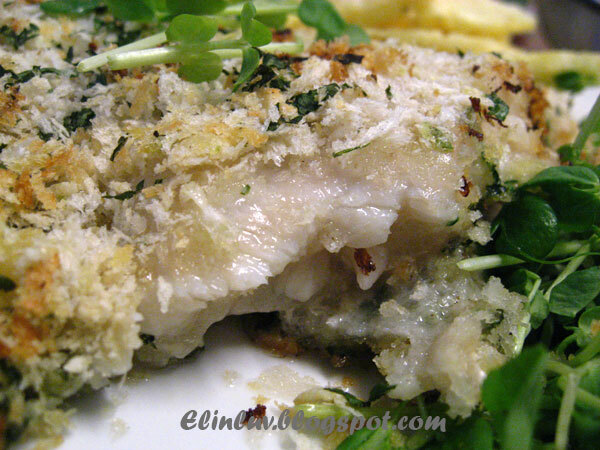 I have almost never cooked fish at home because I don't have that many fish recipes - this one sounds good! Thanks for sharing, Elin. so coincidence, my latest post also adapted from the same magazine, next time I would like to try chicken papillote instead since kids doesn't appreciate fish much. I am sure Carlos is going to like this especially when it is all crispy on the outside. I always have problem thinking of some new way to cook his fish. That looks great, that was surely delicious ! This is making my mouth water. Chicken papilotte is good but the fish is a really great idea. We eat a lot of fish in this house. The meal looks delicious. I love learning new techniques. hi, love your blog . I've met you once in buntong market, remember? i just want to let you know that i've added you into my blogroll..i think i will try out the banana cream pie one of these days. This looks so perfect! I love that you used fish instead of chicken, so will I! I don't think it's possible to be to enthusiastic when it comes to food! Haahaa! Thanks for the step by step prep pics. 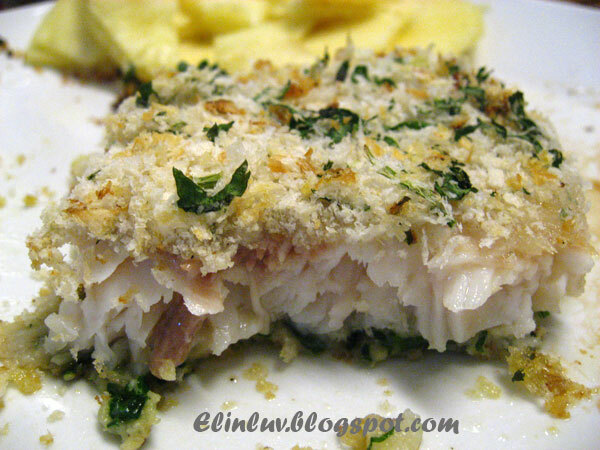 I adore papilotte cooked fish but havn't tried making it myself as of yet. Now I will for sure! The fish looks so moist! I have to try this method. 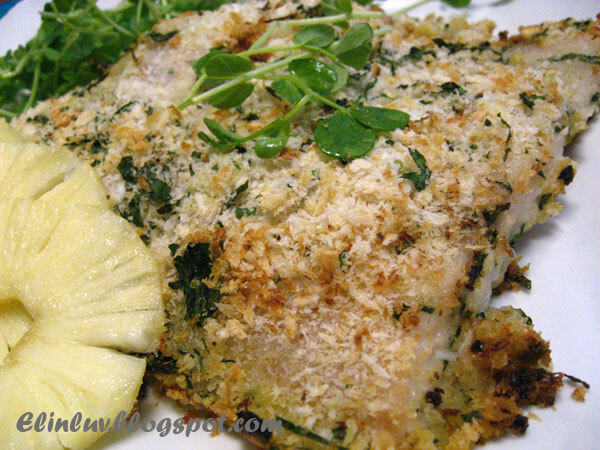 the fish looks moist and delicious. This is an excellent method for preparing a delicious fish - I love your crust!